USA – Timucuan - It’s a simple piece of handmade clay pottery, dug from a pile of oyster shells on a buggy bluff, where the people who left it there got most of what they needed from the waters of the nearby marsh. But with every piece like it, Keith Ashley gets a little closer to helping to figure out more about the people who lived there 1,000 years ago, their social lives and political alliances and trading patterns. They were more than simple, insular people, he believes — instead they were part of a vast trading network that stretched as far as Lake Superior. As evidence, look to the pattern on that piece of pottery: It’s identical to that made by tribes of Indians in middle Georgia, hundreds of miles away. So was this bowl traded to the people who lived in what’s now Jacksonville? Or was it made locally, perhaps by women from Georgia who joined an allied Florida tribe? Radiological testing on the pottery fragment will determine the origin of the clay used to make it, said Ashley, an archaeology professor at the University of North Florida. That will be another clue, added to the clues that come one by one, sifted out of the oyster shells by a team of UNF students who have cleared an area inside the Theodore Roosevelt Area of the Timucuan Ecological and Historic Preserve. It’s at one of the highest points in the park, overlooking the marsh. The shells are arranged in an arc-like shape, like those found in several other sites in North Florida and South Georgia. But was this a village, a place for ceremonial rites, or just a simple trash pile. Testing shows the area dates to between 900 and 1250. So far, searchers have found nothing exotic there. Just ancient garbage: oyster shells, bowl fragments (some with food still encrusted on them) and the bones of fish, turtles and birds. It’s worth looking though, as the site dates to the same time as the rich burial mounds and ceremonial sites of nearby Mill Cove. That’s where archaeologists of the 1890s found arrowheads and jewelry and artifacts from the Appalachians, the Ozarks, St. Louis and the Great Lakes. After 1250 though, the trading over wide areas seemed to stop. Ashley believes the pacts between various Southeastern chiefdoms must have crumbled by that time, leading to raiding parties and battles, not trades. ITALIE – Rome - - If you don't normally think of barbers as academics, then meet Janet Stephens. She's a hairdresser from Baltimore who spends her free time trying to recreate the hairstyles of ancient history and figure out how they did their 'dos. 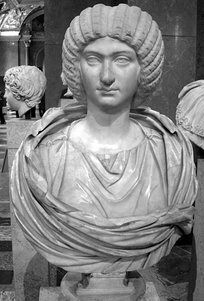 The hairstyle she saw on a bust of a Roman empress was particularly challenging, and to her publishing some original research in a scientific journal. 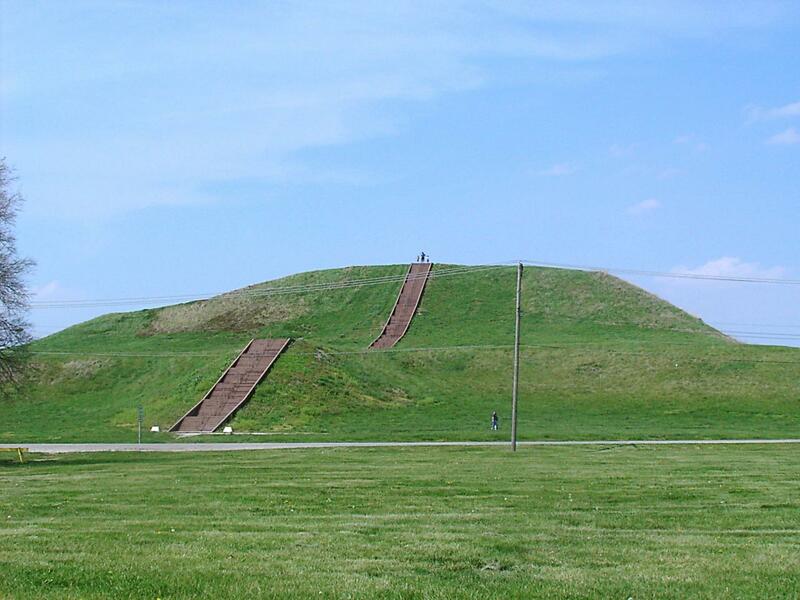 USA – Cahokia Mounds - At its peak, Cahokia was the epicenter of ancient Mississippian culture. With a population of 20,000 in 1250 A.D., Cahokia was larger than London was at the same time. It had every marking of a large city such as population density and surplus capital: everything but writing, according to an exhibit in the visitor’s center. 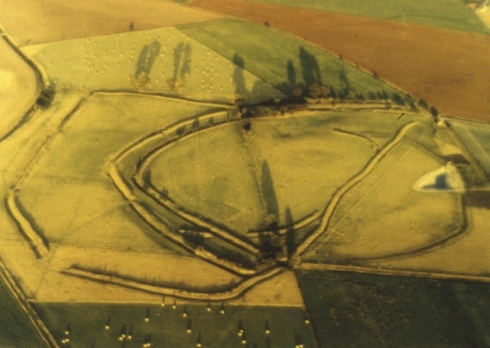 Now, a group of archaeologists from the University of Bologna in Italy are unearthing the mounds, trying to learn how civilizations develop political complexity. Archaeologists are careful about how they talk about Cahokia’s social context. Few indications at the site today allow researchers to classify the city’s political and social structure with any degree of certainty. “Can we call it a state, can we call it a chiefdom? We don’t know what to call it, we don’t know what it was,” he said. “But the idea is to study this complexity, and maybe paths to political complexity that were quite different from those we are used to in other parts of the world.” In 2012, the Italian archaeologists found what they believed were public buildings in the plaza west of Monk’s Mound. This year, the plaster and postholes they found during their most recent trip proves them right. USA - Etowah Indian Mounds - Opting for modern surveying techniques over trowels and shovels, Adam King and his archaeological teams continue to provide insight into Etowah Indian Mounds State Historic Site’s illustrious past. Over the past eight years, King — the research associate professor with the South Carolina Institute of Archaeology and Anthropology — has detected significant elements in soil profiles, such as remnants of residential structures or fireplaces. “We started the remote sensing surveys in 2005, so we’ve been at it for a long time,” King said. “Yes, I do want to collect data across the entire site and I want to do that using different instruments. There are several different remote sensing techniques and they all look at the buried archaeology in a slightly different way. So they generally look at the same thing, but often give you different parts of the larger story. That is why it is best to use more than one technique. “So far we have covered the entire site using a gradiometer, which measures slight changes in magnetism. I hope to do the same over time with ground-penetrating radar, which sends electromagnetic waves into the ground and reads how they are reflected back. After that, we may try some other techniques as well. Really, right now, I am focused on using limited archaeological testing to confirm some of the things I think we have learned so far with the remote sensing. 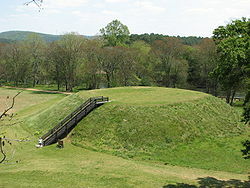 That is what we will be doing later this summer.” Located at 813 Indian Mounds Road in Cartersville, the Etowah Indian Mounds is where thousands of American Indians lived from A.D. 1000 to A.D. 1550. Regarded as the most intact Mississippian Culture site in the Southeast, the 54-acre property features six earthen mounds, a village area, a plaza, borrow pits and a defensive ditch. 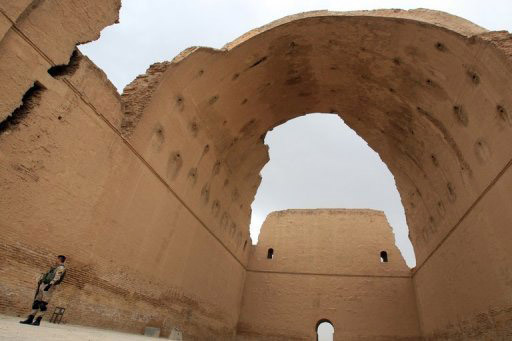 IRAQ – Ctesiphon - The 6th century Arch of Ctesiphon, the world’s largest brick-built arch and the last structure still standing from the ancient Persian imperial capital Ctesiphon, south of Baghdad in modern day Iraq, is to be restored in the framework of a 10-month restoration plan. Construction of the Arch began in 540 AD during the Persian Sassanid dynasty’s long wars with the Byzantine Empire. It formed part of a palace complex started three centuries earlier and, at 37 metres (122 feet) tall and 48 metres (158 feet) long, is the largest brick-built arch in the world. It lies about two kilometres (1.2 miles) from the tomb of Salman Pak, who was originally Zoroastrian but converted to Christianity, and was later sold into slavery to a Jewish family in Medina in present-day Saudi Arabia, before converting to Islam. In 2004, the Global Heritage Fund said that, as a result of disrepair, the arch was “in danger of collapse”.Officials hope a restoration of the arch will revive the whole area, known as Madain, as a tourist destination, but for now, the area is closed off to visitors, with prior approval required for anyone wanting to take a look.